In earlier posts about the Chevrolet Cruze I pointed out the 40 mpg engineers have managed to get out of the vehicle. To do this it uses a number of technologies and when combined they make a huge difference. 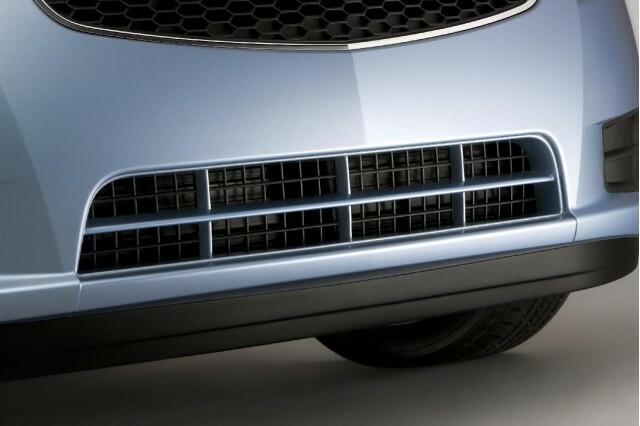 One of the newest innovations is the air shutter system that optimizes the aero dynamics of the car. The air shutter is attached to two electric motors which are controlled by sensors. The sensors measure wind and temperature conditions and will open or close the shutter to maximize gas mileage. At low speeds the shutter is open to increase air flow for cooling the engine and at high speeds the shutter closes to reduce wind drag. Overall, the shutter adds about half a miler per gallon to the averaged city and highway gas mileage. It seems like a small improvement, but over the lifetime of the vehicle and when combined with other mileage increasing technologies it makes a huge difference. As a result of these technologies the Cruze is able to maintain the same gas mileage as the Fiesta sub-compact and beat out the Honda Fit and Toyota Yaris, which all are smaller vehicles. Some other features that contribute to the overall mileage of the Chevrolet Cruze are the 1.4-liter Ecotec turbocharged engine, lowered right height, and ultra-low resistance tires.